Kady Cross has presented an engaging beginning to what's sure to be a fantastic steampunk series in The Girl in the Steel Corset ! She's created a fascinating blend of clockwork and science in her Victorian London that will remind readers of Scott Westerfeld's Leviathan, and is the perfect setting for the tangled mystery spanning over twenty years. Though the very beginning may be a little confusing at first from Griffin's point of view, it does straighten itself out quickly, pulling the reader into the intrigue of Finley's strange personalities, the reason behind them, Griffin's past and thirst for revenge, and the wonderful, witty dynamics between all of the unique, eccentric characters. Besides being full of humor, action, mystery, and some very impressive wardrobes, Cross deals with the issues of identity, deciding to do what is right, and the struggles that come with those decisions in a realistic manner. 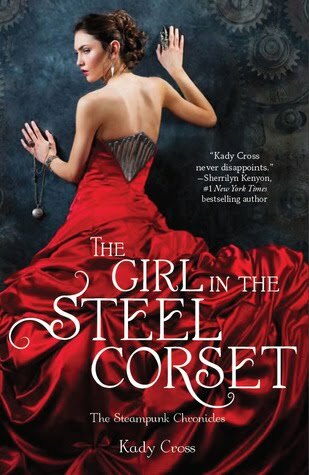 The Girl in the Steel Corset is a smart, inventive, edgy, and dangerous book! Cover Comments: I love the back view of this girl and the way her red dress pops! Very awesome! The book will be out on May 24th, 2011. If you are having a hard time waiting, then check out the free short story, "The Strange Case of Finley Jayne" ! It's a prequel to this book, so you can get a taste of the characters without spoiling the book! Digital ARC received from publisher via netgalley.com. I just can't seem to decide whether this one is going to be for me or not! I do LOVE the cover thou!! Thanks for mentioning the short story. I downloaded that to my Kindle to read. Can't wait!